The new deer fenced area was meant to be housing a few cows this week. 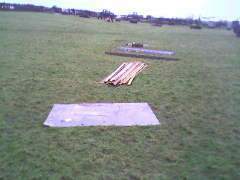 The aim being to work the ground over a bit in preparation for mapping out some terracing with the Japanese village. 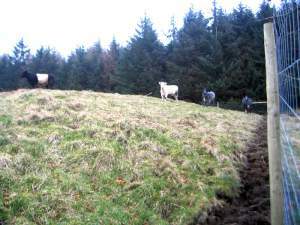 However as the young cows were introduced to the lower gate, they rushed through the field and straight out the top gate that had been mysteriously opened - presumably the night before. There then ensued a lengthy and unsuccessful cow chase reminding me of the incredible irritation factor of livestock. Today John the farmer finally got them back into the field (there is no connection with the deer problem below). The garden has taken a battering this week - as the spring shoots start to emerge the red deer start to move down the hill to pick off the green shoots, unfortunately that means coming through the garden and giving it a quick denuding as they pass. Worst victim has been a tree that was evidently the exact right height for belly scratching. 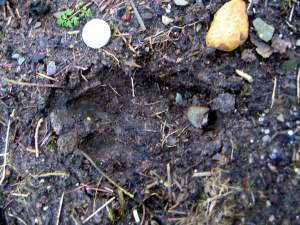 I think it is just one deer that has been working us over, and it's one of the biggest I’ve ever seen (I haven’t actually seen it just prints) - I was convinced it was a cow! The Forestry could shoot it but are unwilling as it will be worth several hundred pounds to a sportsman seeking a good head, the hunters generally come from Germany, I always think it must be a bit strange for them shooting a stag between the mountain bikers and walkers.